“A Daily witness to the majestic Phang Nga Bay sunsets” – The distinctive, boutique style of luxury possessed by Villa Kalipay is truly a life-changing experience. Located in Cape Yamu along Phuket’s scenic eastern coast, this alluring villa unravels some of the most spectacular views on the island. At such an impressive height, you can gaze at sunsets that seep into Phuket’s carved mountainside. You will discover peace and calmness found nowhere else during your stay at Villa Kalipay. The villa caters to top-class travellers who have a taste for exclusivity and extravagance. Upon reaching the villa, you will find yourself entering through the teak front door with the gushing sound of water and some exotic fish to welcome you. Its stylish anterior features are truly breathtaking. The property houses contemporary, handcrafted furniture by the best designers in Thailand, the Philippines, and Nepal. Snowy white marble floors playfully contrast the vibrant blue waters of Phuket Bay and the Andaman Sea outside. 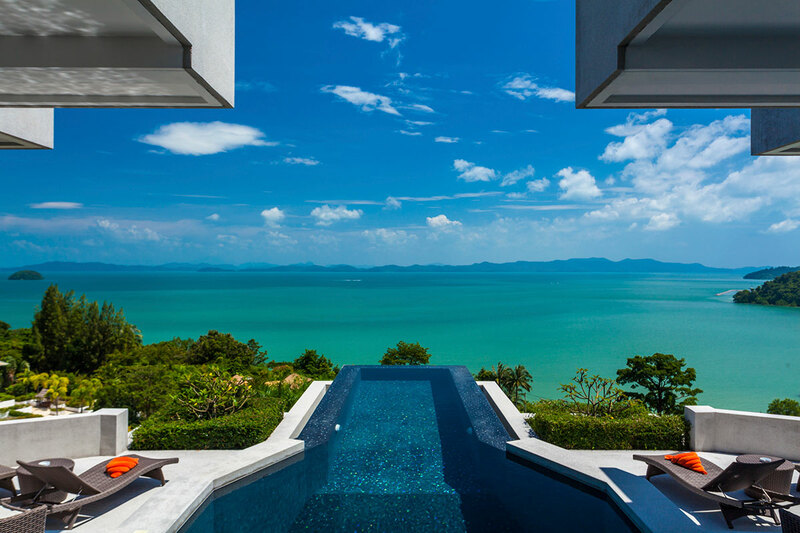 From the villa, you will get a grandiose view of two islands, namely Koh Rang Yai and Koh Maprao. The master bedroom is enclosed with glass windows and doors. Inside it, you will find a spacious walk-in closet and an attached bathroom with bathtub. The bathroom also features an alfresco, perfectly concealed by palm trees for complete privacy. You can even play your favorite music on the villa’s advanced sound system. Villa Kalipay also provides wonderful options for your meals. You can choose to eat outdoors on your bedroom balcony, while the sky changes its color from one shade to another. You can also dine indoors, while the cool breeze blows into your room. For breakfast, you can sit in the kitchen and enjoy watching fishing boats pass by. For every option you choose, the villa will create a unique ambiance with appropriate lights and music, making your experience nothing short of cathartic. For additional activities, you can practice yoga or pilates, or can make a trip to nearby golf courses or enjoy the islands by renting a Yacht. Whether you wish to spend your time by the poolside to tan under the sun or to relax and entertain yourself in the theatre, Villa Kalipay is sure to delight you. Product Description: “A Daily witness to the majestic Phang Nga Bay sunsets” – The distinctive, boutique style of luxury possessed by Villa Kalipay is truly a life-changing experience. Located in Cape Yamu along Phuket’s scenic eastern coast, this alluring villa unravels some of the most spectacular views on the island. Send an inquiry about Villa Kalipay, Phuket.